Jay Cutler had his first strong fourth-quarter performance of the season to lead the Bears to a 26-20 come-from-behind victory over the Philadelphia Eagles Monday night. The Chicago Bears mounted their first fourth-quarter comeback of the season to defeat the Philadelphia Eagles on Monday Night Football on Nov. 7. After jumping out to an early 10-0 lead, Chicago watched it slip away as Philadelphia recovered two Matt Forte fumbles and turned them into touchdowns. By the end of the third quarter, the Bears found themselves down by four points. 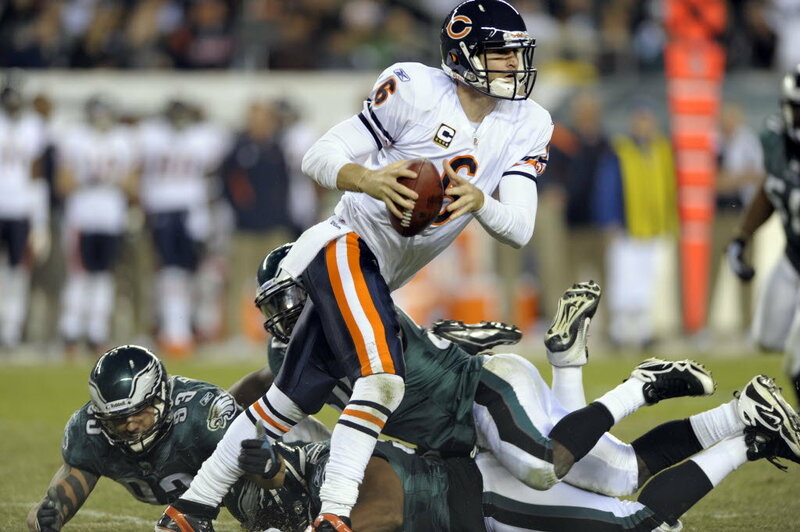 In their first possession of the fourth quarter, however, Bears QB Jay Cutler took charge. In contrast to his performance late in games so far this season, during which he threw four interceptions and one touchdown, in the fourth quarter Monday night, he completed 75 percent of his passes for 60 yards and a touchdown. Cutler credited his much-maligned offensive line for his success in crunch time. "It starts up front," he said. "If my feet are clean, and I've got a good pocket and I can see what's happening downfield, I'm probably going to have a good day." In the first five games of the season, Cutler was sacked 21 times. In last night's game, he wasn't sacked once. Philadelphia had a chance to regain the lead late in the game, putting together a drive into Chicago territory; but the Eagles came up short when tight end Jeremy Maclin fell down just short of a first down on fourth-and-10. Philly's "Dream Team" is now 3-5 on the season and three games out of first place in their division.